Happy Friday! How was every one's 4th of July? Mine was a blast, which is why I've been a little absent from the blog this week. I spent the holiday up at the lake with my family, and couldn't have asked for a more perfect 4th (well, actually that's a little bit of a lie, it would have been more perfect if my mom and her husband could have made it, as I love when the entire family is together). We had such beautiful weather, and spent most of the time eating, drinking, and boating. The twins birthday was this past Monday, so we had a little party for them at the lake, and it was so fun to have all of their cousins together to celebrate. I still can't get over the fact that my boys are three! Speaking of the holiday, this dress would have been a fun option for the 4th of July. 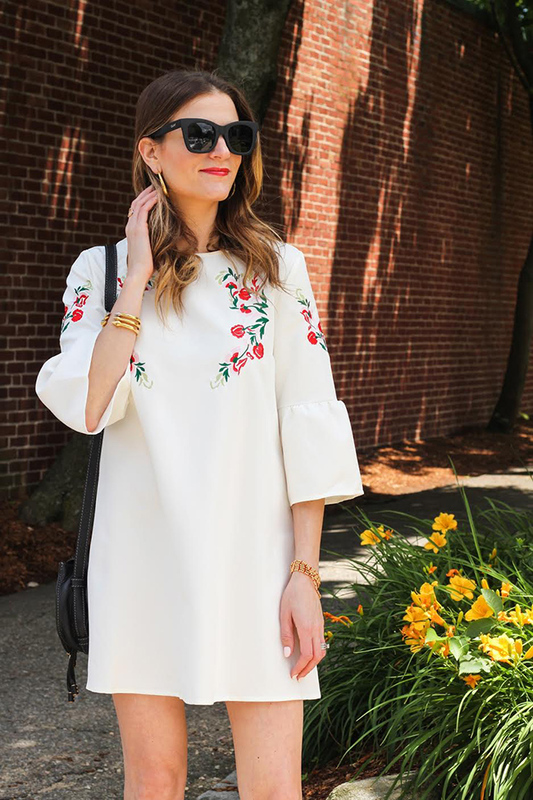 I believe that every woman should have a little white dress in her closet, and since embroidery is huge this summer, this bell sleeve embroidered shift dress makes a perfect addition. Not only would it be a great option for a bridal shower or dinner rehearsal (if you're a bride-to-be), but it's the perfect dress to throw on for all of your summer events. I decided to go for a dressier look by pairing it with my black lace up heels, but can also see myself pairing it with flat sandals for an cute, yet easy, outfit whether headed brunch or a family BBQ. I love the contrast that the black heels added to this white dress, but to tie them in, I finished my look with my black Chloé bag and black sunnies. Once again, they these Quay sunglasses are sold out in black, but they're available in pink, which I think I need to get! When the black come back in stock, I'll make sure to let you know. The feature blogger is Chrissy of Granola & Grace. You know that I'm a sucker for anything off-the-shoulder, so it's no surprise that I'm in love her little white dress! Make sure to visit Chrissy's blog and say hello! That is such a gorgeous dress! Love the sleeves and embroidery detail! Thank yo for the linkup! Enjoy your weekend! Your 4th of July sounds fun, it is always great to spend it with family! I love the bell sleeves and embroidery on this dress! I have the same dress and love it. The embroidery is just so fun. Loving the contrast of your black. Bummer your hubby and mom couldn't make it, but it sounds like you had an otherwise lovely time! Happy, belated, birthday on your boys! Sounds like you and your family had a great time! Gorgeous look! LOVE the embroidery and the shoes! Such a pretty dress! I love the sleeves and the embroidery detail. Those sunglasses are fab too! Stunning dress, it really really suits you! Such a pretty dress! Love the embroidery and the fact that it's so versatile. Definitely one that can be dressed up or down. A perfect summer piece! I absolutely LOVE everything about this look!!!!! The details in this dress are stunning!! This dress is so pretty! I love the embroidery and bell sleeves. Beautiful! This dress is gorgeous. I love everything about this look. And those shoes are perfect. All the details of this dress are so lovely. A great look as always. I love love that LWD especially because it has my current favorite trends - embroider and bell sleeves. I've wanted to get this dress for so long but I was scared it might be see-through. But you totally made me change my mind - it looks so gorgeous! This shift dress is everything! I love the print on it and the subtle bell sleeves! Perfect look as always. I love the black shoes and handbag. It's the perfect chic accessories. Glad you enjoyed your 4th! Have a fab weekend! If you need short formal dresses,see hoco dresses heredress is everything! I love the print on it and the subtle bell sleeves! You look beautiful in this embroidered shift dress. And I love the sandals that you paired it with! I linked up to your link up. P.S. I organize link up on my blog, feel free to share your latest article. It will be my pleasure to have you. What a pretty dress! Love the embroidery! This dress is completely gorgeous I am in love with it. The shoes went SO perfectly with it. You paired stunning accessories too! You're SO chic! That dress is gorgeous! I love the embroidery and bell sleeves! Your legs look miles long in this dress! I seriously want this adorable dress in my life. I love anything with a little embroidery. Too cute! This dress is so pretty! I'm loving the embroidery trend this summer it's so fun! I'm glad y'all had a great birthday weekend with the twins! Such a lovely dress!! So cute! i love those lace-up shoes and i'm obsessed with embroidery right now too! That does sound like such a delightful 4th! 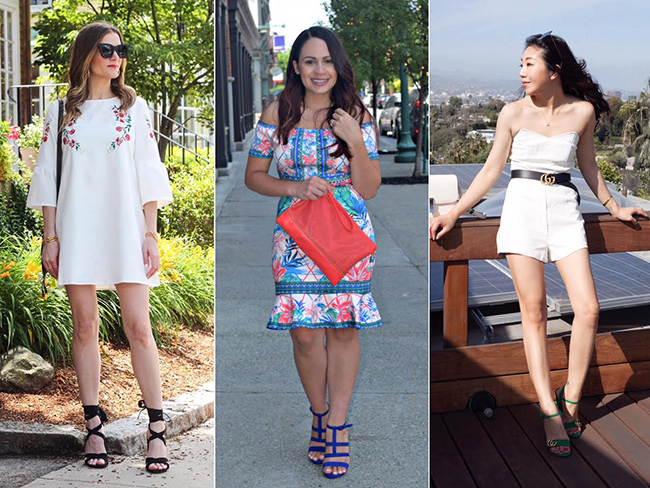 I really love your LWD, and completely agree it's a summer essential! That dress is so pretty! Love the embroidery detail and those shoes are amazing! If only I could wear this dress style, I'd buy it without thinking twice! So cute!